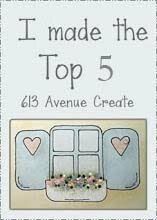 Princess' Paper Projects: Little Red Wagon Challenge #364 ~ Let's Party!! 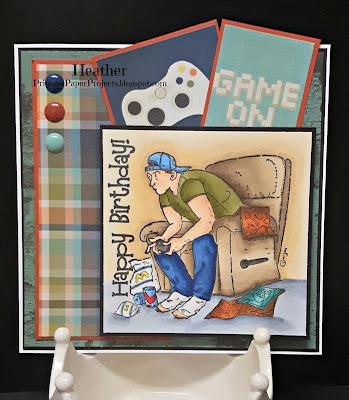 Little Red Wagon Challenge #364 ~ Let's Party!! Hello once again. If these weeks were any shorter, I am not sure if I would accomplish anything. 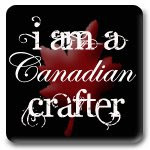 I hope I can say time flies when you are having fun as I try to get organized for this craft show. I have 4 more weeks.....and hopefully things will go back to "normal". What that really means is not stressing about how little I got done in a week for the show. Well, it is another challenge day at Little Red Wagon and today our fearless leader Jan is in charge. Her theme is LET'S PARTY ~ now as fun as that sounds she does have a certain kind of party in mind ~ birthday parties. We want to see your birthday party celebration projects this week. October in our family is full of birthdays so this was great timing for me. Stamp used is Stamping Bella Game On and matching paper is from Simple Stores So Rad. 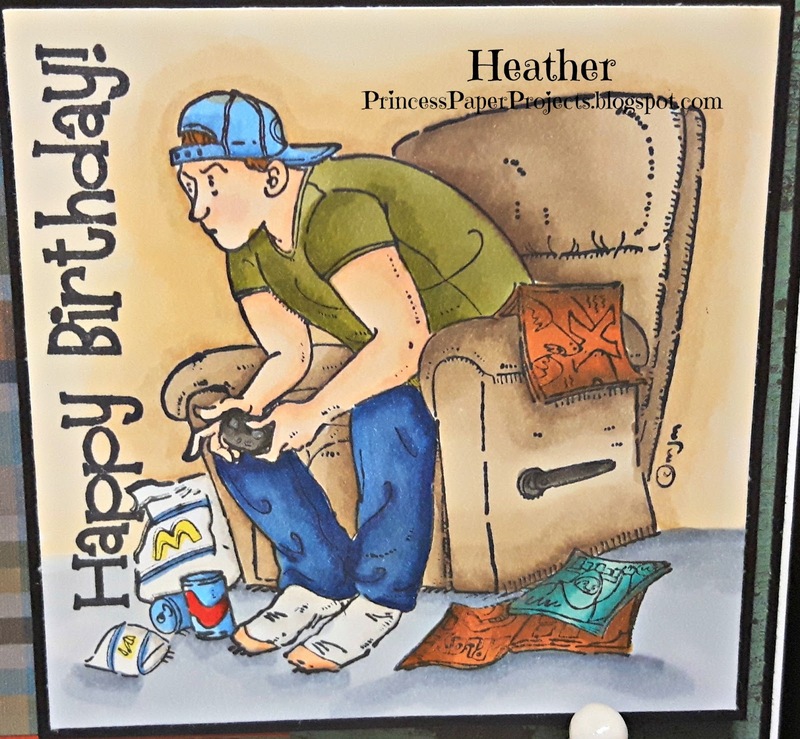 Coloured up with my Copics and the addition of a few matching enamel dots and a masculine birthday card ready to go. 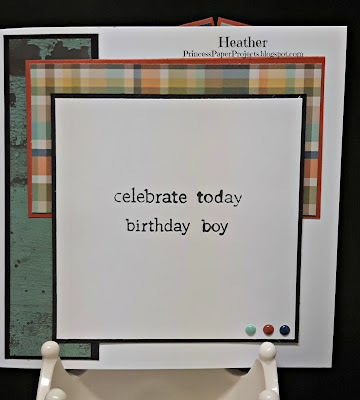 Why not head on over to the Little Red Wagon blog and link up a birthday project of your own. 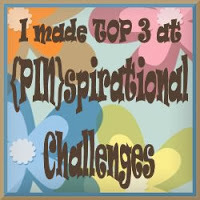 Make sure you check out all the inspiration from the other girlfriends as well. Thanks for dropping by. See you again soon. And have a WONDERFUL WEDNESDAY!!! 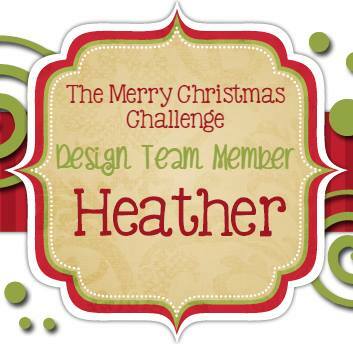 Fantastic card, Heather! Fab colouring and those cards are perfect. 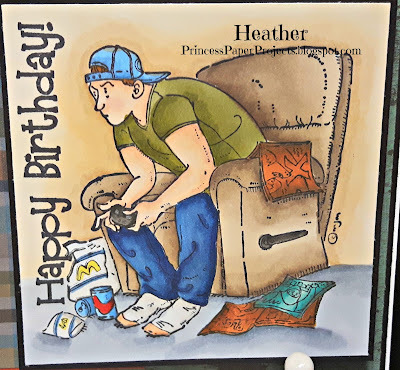 Super card - and just perfect for a teenage boy!! Love it! Best of luck with all your preparations for the craft show. I'm sure that everything will come together for you!